Apart from our traditional cobbler’s work, we also specialise in the restoration of boots from the Irish boot maker Dubarry. Being their official boot repairer in the Netherlands, we have full access to the original materials. 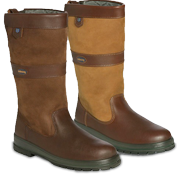 This enables us to refurbish your Dubarry boots to a their (almost) original condition. We also sell a full range of Dubarry care products. You can find more information about Dubarry on their website: www.dubarry.com.